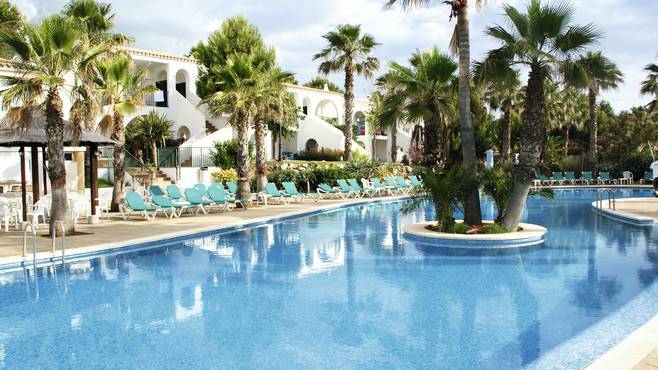 We are a family of ten all different ages and we have been to Menorca twice however we normally stay in Agua Marina and love it there but we thought this time we would try somewhere new. We all travelled to Marina parc hotel 8th September and we arrived back home today. Once we arrived at the hotel we were so tired and the children were restless due to travelling early hours. Once we arrived at the hotel we were told the main family room two adults , 1 8 year old child & 2 year old child was not ready and wouldn’t be for atleast another hour , this annoyed us to be honest therefore the children had to come in mine and my partners room. It was actually two hours later when the family room was ready which enabled everyone to get unpacked and settled. The first night was a quiet one and the food in the restaurant was ok not brilliant but good for value, the drinks were fine and the children loved it! The hotel advertise an onsite steak house which we were all up for, however you do have to make a reservation so we booked two days in advance for us all to enjoy a steak. We all got dressed up and went to the steak house only to find the chips, vegetables & potatoes were cold. My brother law informed the chef of this and we were told it was good enough , we then looked at the steak menu and there was sausage, bacon, chicken & skirt steak this was not a steak house at all! You did not get served and the food was cold and the staff were unhelpful, my step father was disgusted and decided to go down the road to an amazing steak house which cost a lot as you can imagine we are a family of 10. The next day we all get ready for dinner in the main restaurant we walked up to the entrance and the tables outside were available so we all sat down and waited patiently for the doors to open for food. We were then greeted by a spainish manager of the restrurant who shouted something in Spanish very aggressively & then called my brother in law an English something and started going on about England we asked what his issue was and he said the food wasn’t open yet which we understood. We had not done anything wrong at all but were ordered away from our tables and made to stand in a que which no body was in ! to pay lots of money to have bed bugs in everyone’s bedding! There are a few points that isn’t great about this hotel apart from the above. 3: the entertainment is minimum, you have a quiz from 9:30 till 10:30 and a children’s mini disco from 8:30 till 9:30 and that’s it nothing else. They advertise entertainment ... now if you class a quiz entertainment then great. We will not be returning to this hotel ever! The hotel refunded us for our meal out 150 Euro and changed our bedding. That is what we got as a gesture they said !! We booked a week at marina parc, all inclusive, which turned out to not be worth the money we paid! We stayed in room 338,which is in desperate need of a deep clean and update! (See pictures). Even after the maids had been and 'cleaned' the room it seemed like they done nothing but make the beds and leave us half used toilet rolls on the top of the toilet. The shower was dirty and because of the pressure from the shower head (which could not be altered) we ended up having to tie the shower curtain up because otherwise it just blew and got stuck to you while having a shower.The shower rail was attached to the ceiling with what looked like the chain from the bath plug. The dining chairs all had stains on the fabric seat which didn't look pleasant at all.There were also plugs in the room which were loose on the walls. The bar which was at the pool closest to out room was closed, with no explanation at all, and remained closed for the duration we were there. The water park was a disappointment and most of the slides were also closed the duration we were there. Most of the staff seemed like they didn't want to be there and struggled to smile! The food was a massive disappointment with mostly the the same things been offered everyday and for the dinner and tea sittings and the snacks were the same everyday. Amongst other things the Pasta was well over cooked and mushy whereas the carrots and broccoli was well under cooked and still hard. This lead to us eating out most days. The poolside were full of wasps to the point where you had to drink your drink as quick as possible or there would be a swarm of them around and in your cup. Luckily there is a beach around 10 minutes walk away where you can escape to! There was no evening entertainment offered either. I would not return or recommended Marina Parc to anyone and definitely dont think this should be a 4* hotel! Changes need to be made. Hotel tip: The beach is lovely! But stay away from this hotel! I pride myself on being a very amicable and truthful person and I have never written a negative review in my life, until now. We arrived on May 31st and were informed by the receptionist that we would be in D1 the restaurant area but after looking for the key, checking her clipboard, looking for the key again then after having a conversation with another receptionist we were given the key to 611 (the room from hell) in area D2. When we got the room room it turned out to be a twin with a drop down child bed, not what we had paid for. We had paid and booked for a twin room with a sofa bed in the lounge and this room did not have a lounge, it had one window in the bathroom and the only view out was from the patio door looking straight at an hedge. I returned to reception who were not interested at all in sorting out the problem and neither was Thomson's team leader rep (Kate) who was totally inept. In fact the only rep that took time to understand and talk to us about our problem was Ria, who we can not praise enough. On Thursday 1st I went to reception at 09.00 - 09.30 to let them know we had no toilet paper, I again returned at 12.30 - 13.00 to say we still had none and again at 17.00. Eventually some was delivered to our room around 18.00. On Saturday 3rd I went to reception at 07.00 to report that the toilet system would not fill so we could not flush the toilet, I returned again at 12.30 and 17.00 before some one eventually turned up at 15.45 to mend it. The three pools were clean and each had a child's area. The water park had a lot to offer but the paving will cut small children's tender soles if your not careful, having said that it is a lot of fun for the family. The restaurant appears to have a wide choice of food but it soon becomes repetitive and 80% of the food is cold to tepid at best. The hotel manager is a waste of time and the staff while being friendly are not always helpful this also goes for the Thompson representatives who are happy and helpful if you don't have a problem. I hope you don't but if you have a problem and need a rep seek out Ria. The web site for Hotel Marina Parc states that it is a 4 star while Thompson's say it's a 3 star. I would say the facilities are 3 star NOT 4 STAR but if you get a room like ours it's 1 star at best. If you want a place where you can sit by the pool all day, sunbathing and or drinking while the kids are in the pool then this is ok but if like myself sometimes you want to be able to chill out with a cold drink then there are far better options than Marina Parc.